In Andorra fifteen different religious communities coexist peacefully. In the article four couples share their testimony how they live together without conflict, despite their different believes. The couples are a Catholics wife and Muslim husband, a Hindu husband and a Catholic wife, a Buddhist husband and Catholic wife and a couple from Unification Church. The life of Lluis & Chatiboot have been changed. They were united through the religion. They had been matched and married by Rev. Moon, the founder of the Unification Church, their Messiah whose decisions they trust. 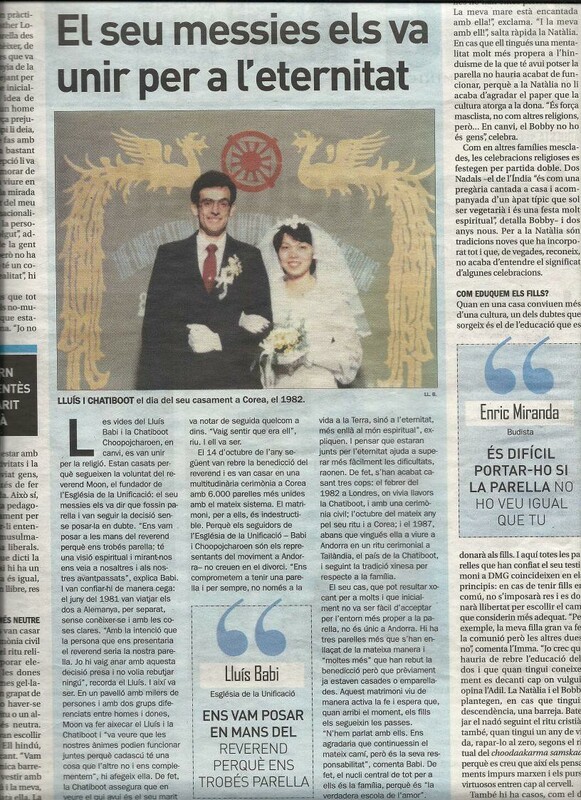 On 14th of October 1982 in Korea, they received the Blessing and married in one of the big ceremonies together with other 6.000 couples in the same stadium. For them marriage is indestructible. They do not believe in divorce. They promise each other to be partners not just on earth but also for eternity in the spiritual world as well. The family is for them the core of everything. It is the school of true love.